Supermarkets in North America are going through massive change as companies rethink the way they bring food to customers’ table. While click-and-collect and home delivery are certainly going to increase as grocers figure out how to deliver a better online experience, most shoppers will still prefer to see, smell, and touch the food they bring home to their families. Sharon Eugene, Creative Director of Branded Environments, wants to see something fresh when she walks through the door. This could be flowers, baked goods, produce – but whatever it is, it needs to be beautifully presented. That means well-lit, beautiful display cases, and clear signage. Produce needs to be lit so the color is true; for example in this design for Calgary Co-op, lighting drops down from the high ceilings to give an intimate warmth and ensure the natural bright appeal of fresh fruits and vegetables is maximized. Sharon also loves a great bakery – one with cakes on display, in well-lit glass display cases and fills the air with the aroma of freshly baked bread. 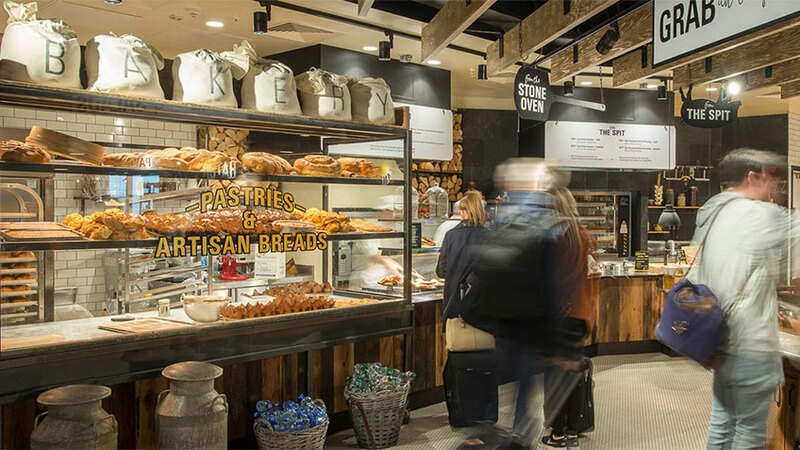 A market feel can be achieved through simple touches – like crisp white aprons for employees, merchandise in baskets, wooden crates and barrels, and items like baking utensils and flour sacks as visual cues. Displaying elements of the food preparation in action will enhance the appeal of freshly baked goods. Several of our designers want to discover new products and enjoys samples at the supermarket. Not only is this a great way to support private label programs, but it slows the customer down and changes their frame of mind by engaging their senses. 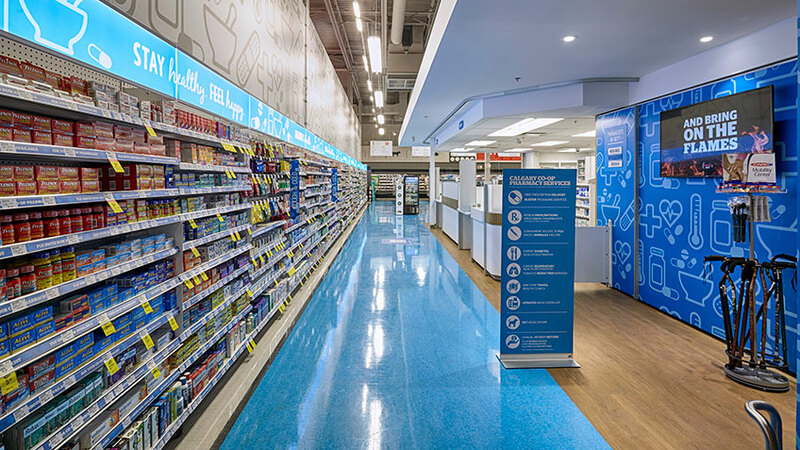 Richard Dirstein, EVP of Creative, thinks the entrance way is a great place to have new products featured in beautifully merchandised displays. 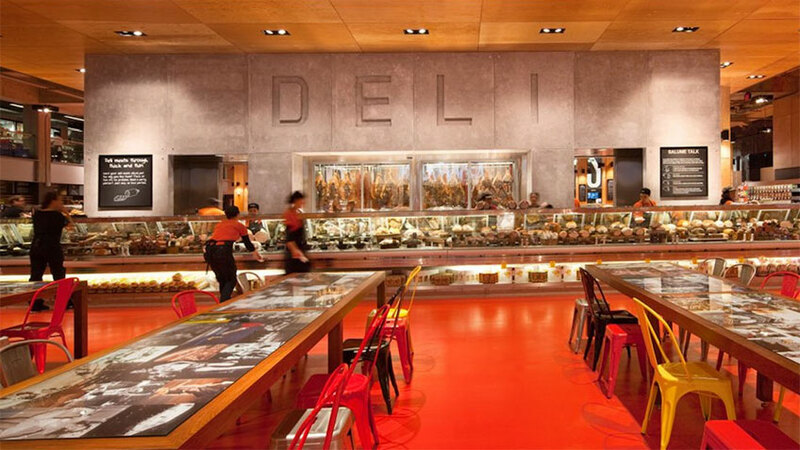 A deli or market style counter with hot meals and meal kits, along with a curated selection of new products including wine, makes an easy one-stop-shop for a last-minute dinner. Beverly Wells, Director of Branded Environments, hates having to double back on her route through the supermarket, even if she is there with time to explore. Although some brands are dabbling with free style layouts in the supermarket world, the traditional grid layout is still the easiest way for shoppers to navigate a store. Aisles should be wide enough for carts to easily pass each other, and signage needs to be easy to read and provide easy navigation for hard to find items. Wayfinding can also be facilitated by colour-coding and wall graphics. Our designers have mixed feelings about cafes and came to the conclusion that if you are going to do it, it must be done right. If you’re considering a café, it must be as well designed and well planned, as with any standalone foodservice operation, in order to make the investment worthwhile. Otherwise, shoppers may pause here to tie a shoelace, but the café will not drive sales or add value to the shopping experience. If you are considering more ready-to-eat meals and want to introduce foodservice in your grocery store, Shufersal Azriely in Tel Aviv, Mercato e Cucina in Sydney, Australia, and Loblaws “SUPER” “MARKET” in the former Maple Leaf Gardens provide some inspiration for creating public space within a grocery store where people will want to linger. Shopping for groceries doesn’t have to feel like a chore. A great customer experience can drive sales and brand loyalty, making the experience one customers will drive the extra mile for.